The L-3 ACCOLADE Wireless Mesh Communications System is an MSHA-approved, integrated wireless communications and tracking solution. 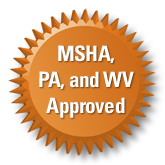 The system is compliant with the safety requirements of the 2006 MINER Act and MSHA policy guidance. The states of West Virginia and Pennsylvania have also approved the system. However, ACCOLADE is more than just a safety system; it also enhances day-to-day mining operations with its ability to provide direct communications to all employees and link into existing systems. ACCOLADE is backed by the resources of L-3 Communications, a global technology solutions company. L-3 has developed the ACCOLADE Wireless Mesh Mine Communications System to enhance safety and increase operational efficiencies for underground coal mines. The system was originally developed under a competitively-awarded research and development contract from the National Institute for Occupational Safety and Health (NIOSH). The L-3 ACCOLADE system provides a self-healing, redundant, and survivable voice and data network, which allows voice and text communication among miners underground (peer-to-peer) and communication between below- and above-ground personnel. The system also provides a real-time situational awareness capability. The Mine Operations Center provides the central point for monitoring the network and tracking the position of all personnel within the mine. Miner Mesh Radios provide each miner with robust voice and text communications, as well as a locating capability. Fixed Mesh Nodes strategically located throughout the mine allow for dynamic routing of all communications throughout the network. Gateway Nodes serve as interface points between the above- and below-ground networks.